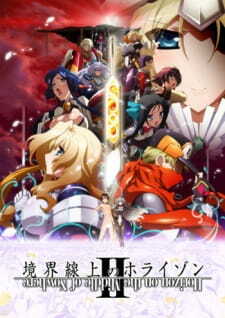 Continuing the story from before, Kyoukaisenjou no Horizon II brings more fan service, laughter and action of the battles between various nations and groups. Taking advantage of the opportunity that the Mikawa Conflict provides, Toori and his comrades attempt to rescue Horizon from the Testament Union. But even as the Floating City Musashi speeds towards its next destination, the Floating Island England, Tres España is preparing its own armada for war against the British Islanders. Now, as the quest of Horizon's emotions builds to its climax, Toori's new battle is about to begin in the land ruled by the Fairy Queen! The reenactment of the history described in the mysterious Testament continues as the secret of the Armor of Deadly Sins is unleashed in the spectacular second season of Horizon in the Middle of Nowhere! The story like before is no simple plot indeed. It mixes in alternate historical timelines with futuristic gadgets all the whilst dealing with action and fantasy elements which results in a convoluted plot. If you clearly analysed each and every character and faction in the prequel, you may still get lost as the sequel introduces even more characters than before. The story itself doesn't even focus on Horizon that much but rather the conflict between Musashi and the other factions. Bunched together are nonsensical plot devices that are used and some quite silly elements throughout the anime makes the story a bit of a hit and miss. I got to say though, it was slightly more interesting than the prequel. The art was once again well done. Characters were well designed and the special effects are endless. The CG elements (for the ships flying through the sky) were really well done and the animations were fluid. The backgrounds and scenery were high quality and beautifully illustrated. The voice acting was pretty much the same as the prequel. The new characters' voice acting were also of high standard and quality. They suited the characters really well. The theme songs were once again quite average and weren't that spectacular or memorable or anything; but it suited the anime's theme nonetheless. I must praise the nice use of background music as well as the plentiful of sound effects in every episode. It brought the anime to life and made it even more enjoyable to watch. Once again Toori Aoi is felt a bit useless in the anime. By the time you reach the middle of the series, you would have already concluded that Toori Aoi will always be the class clown, the joker, the guy that does pretty much nothing in the anime. I have to question why he is constantly naked in the anime? I can't remember given any explanation of it. Anyhow, Horizon is still dull and expressionless as ever and she also plays a rather minor role in the anime. Rather though, the anime focuses more on the group as a whole than specific characters. I really wanted Toori Aoi to actually do something worth while, but in the end, his friends pretty much took the spotlight. Perhaps a sequel will arise in a few years. The story ended with a sense of continuation with no near end in sight. I did enjoy the action scenes, comedy elements and the whole fan service of it all. I am still slightly confused at the storyline and at what actually is going on between these factions. All I know that a bunch of nations are trying to avoid a world Apocalypse by re-enacting historical events. Something like that.